(live-PR.com) - Jason Momoa, who rocketed to superstardom in Justice League (2017) and Aquaman (in theaters now), will attend Wizard World Cleveland on Saturday, March 9, at the Huntington Convention Center of Cleveland and Wizard World St. Louis on Saturday, April 6, at America’s Center. At both venues, Momoa will greet fans, sign autographs and pose for photo ops. 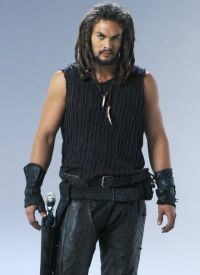 in the popular series "Baywatch" and "Stargate: Atlantas" before a turn as "Khal Drago" on the acclaimed "Game of Thrones" was followed by his first appearance as "Aquaman" in Batman vs. Superman Dawn of Justice in 2016. That led to a larger role as the undersea superhero in Justice League and star billing in the current hit release. Momoa's other credits include the title role in both Conan the Barbarian (2011) and Braven (2018) and opposite Bruce Willis and John Goodman in last year's Once Upon a Time in Venice. In Cleveland, Momoa joins Tom Welling and Michael Rosenbaum, who starred as the Man of Steel and his criminal nemesis alongside John Glover (“Lionel Luthor”) in the long-running series “Smallville,” Sean Astin (The Lord of the Rings, “Stranger Things 2”), Chad Michael Murray (“One Tree Hill,” “Agent Carter”), Matt Ryan (“Constantine,” “Legends of Tomorrow”), the “Charmed” trio of Holly Marie Combs, Brian Krause and Drew Fuller, Butch Patrick (“The Munsters”) and Thomas Ian Nicholas (Rookie of the Year, American Pie) and more, as well as an outstanding array of programming, live entertainment, cosplay contests, gaming and more at the fifth annual Wizard World Cleveland, March 8-10. In St. Louis, Momoa will attend alongside Sean Astin (The Lord of the Rings, “Stranger Things 2”), Chris Kattan (“Saturday Night Live,” A Night at the Roxbury), the “Charmed” trio of Holly Marie Combs, Brian Krause and Drew Fuller, Daniel Cudmore (X-Men, Twilight Saga: Breaking Dawn - Part 2) and Thomas Ian Nicholas (Rookie of the Year, American Pie) and more, as well as an outstanding array of programming, live entertainment, cosplay contests, gaming and more at the seventh annual Wizard World St. Louis, April 5-7. Wizard World is also the place for cosplay, with fans young and old showing off their best costumes throughout the event. Fans dressed as every imaginable character – and some never before dreamed – will roam the convention floor and participate in the famed Wizard World Costume Contest on Saturday evening. For more on the 2019 Wizard World Cleveland, visit wizd.me/ClevelandPR. For more on the 2019 Wizard World St. Louis, visit wizd.me/StLouisPR. Wizard Entertainment, Inc. (www.wizardworld.com) produces comic, gaming and pop culture conventions across North America that celebrate the best in pop culture: movies, television, gaming, live entertainment, tech, comics, sci-fi, graphic novels, toys, original art, collectibles, contests and more. A first-class lineup of topical programming and entertainment takes place at each event, with celebrity Q&A's, comics-themed sessions, costume contests, movie screenings, evening parties and more. Wizard Entertainment has also teamed with Sony Pictures Entertainment to find the next generation of movies as well as to engage in a number of strategic initiatives. Additional initiatives may include an augmented touring schedule of Wizard World shows, fixed-site installations, curated e-commerce, and the production and distribution of content both in the U.S. and internationally. Fans can interact with Wizard Entertainment at www.wizardworld.com and on Facebook, Twitter, Pinterest, Instagram and other social media services. The 2019 Wizard World convention schedule is available at: www.wizardworld.com/comiccon.